If your ability to work has been reduced, do something about it right away. Rehabilitation is the primary alternative when you have problems with your ability to work. You can discuss your health together with your employer and the occupational health care at your workplace. You can also contact a rehabilitation consultant at your own pension provider. training that leads to a new occupation or profession. You can get vocational rehabilitation also if you are self-employed. Kela arranges vocational rehabilitation especially for those outside working life, the young and those with a partial work ability. Kela arranges rehabilitation also if the criteria for vocational rehabilitation under the earnings-related pension scheme are not met. In addition, Kela is responsible for medical rehabilitation, psychotherapy and rehabilitation and adjustment training. Who is vocational rehabilitation for? you do not have the right to rehabilitation based on workers’ compensation or motor liability insurance. stay longer in working life. Your vocational rehabilitation begins with your application for the right to rehabilitation. If your application is accepted, you will get a preliminary decision on your right to rehabilitation. The decision is valid for 9 months. That means that your rehabilitation must begin at some point within those nine months. 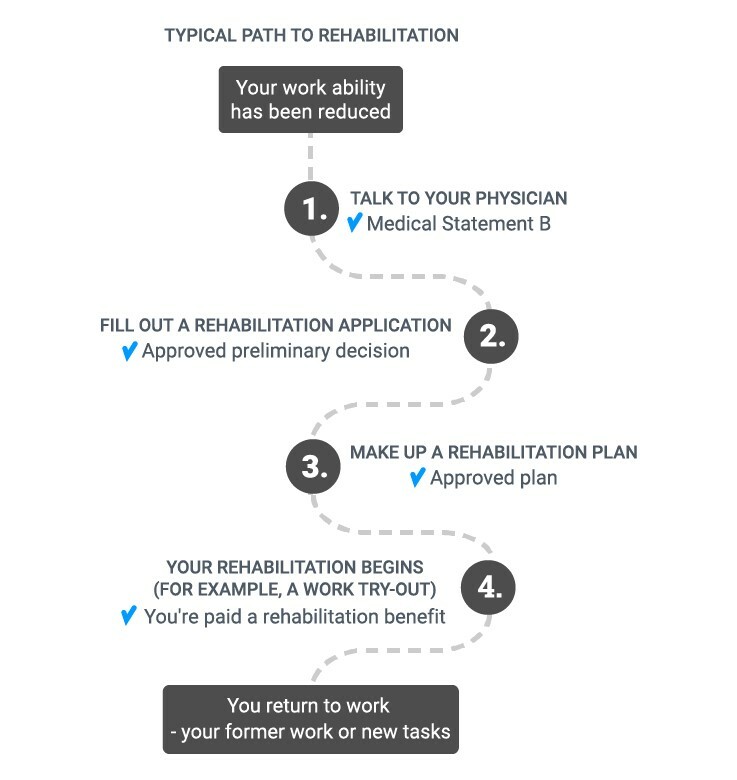 If you have a ready rehabilitation plan when you apply your right to rehabilitation, attach it to your application. That way your pension provider can take a stand on your rehabilitation plan at the same time. You can also get a preliminary decision on your right to rehabilitation when you have applied for a disability pension and you meet the criteria for vocational rehabilitation. When you have got the preliminary decision, you have to draw up a rehabilitation plan and send it to your pension provider. Occupational healthcare or your pension provider can help you draw up the plan if needed. If your rehabilitation plan is accepted, you will get a decision in support of your plan. You will also get a separate decision on the rehabilitation allowance or rehabilitation increment that you will be paid during your rehabilitation period. The other benefits you will get depend on your rehabilitation programme. When your rehabilitation programme ends, you will no longer be paid rehabilitation allowances. Hopefully you can return to working life after your rehabilitation period. Vocational rehabilitation is individual. It is carried out according to your rehabilitation plan, which is based on your needs. You have to draw up your rehabilitation plan yourself. If necessary, you can get help from the experts at occupational healthcare at your workplace or your pension provider. As a rule, the first step is to find out if work arrangements can help you continue in your former work tasks. If not, you may be assigned new tasks at your workplace or at a new workplace. If you cannot return to work through work arrangements, perhaps you can train for a new occupation or profession. The assessment of your need for rehabilitation and your rehabilitation plan are all based on your overall situation. Your age, education, work experience, other skills, motivation, health and predicted state of health are all taken account of. How do I apply for vocational rehabilitation? If you meet the criteria for vocational rehabilitation, apply for rehabilitation from your own pension provider. You have to fill out the application form yourself. Attach Medical Statement B (filled out by your physician) to your application. Check your own pension provider’s website to see if they have an online application service. You need your online banking credentials to log into the online application service. You can also apply for vocational rehabilitation with a paper form or by filling out and printing an online form (2136). During your vocational rehabilitation, you will receive a rehabilitation allowance equal to the amount of your disability pension plus an additional 33 per cent. If you are on a rehabilitation allowance, that is, if you are getting a partial disability pension when your vocational rehabilitation begins, you will also get a rehabilitation increment. The rehabilitation allowance and the rehabilitation increment are paid only during your rehabilitation period (period of work try-out, work counselling or training). When you have got the decision on your rehabilitation benefit (rehabilitation allowance or rehabilitation allowance + rehabilitation increment), ask for a new tax card from the Tax Administration. If you are working during your rehabilitation and earn more than half of your stabilised earnings on which your disability pension would be calculated, you will receive a partial rehabilitation allowance. It is 50% of your full rehabilitation allowance. Uncertain conditions, while you are waiting for your rehabilitation to start, you may get a discretionary rehabilitation assistance if you have no other income. The rehabilitation assistance is of the same amount as your disability pension. Costs arising from rehabilitation are compensated separately according to the guidelines of the Finnish Pension Alliance TELA. In 2017, approximately 61 per cent of those who completed their vocational rehabilitation returned to work. Roughly 7 per cent remained unemployed or continued studying. 6 per cent retired on a partial disability pension and 6 per cent on a full disability pension. 20 per cent failed to complete their rehabilitation. You can get individual guidance from your pension provider when you apply for rehabilitation and when you make up and carry out your rehabilitation plan. You can do a work try-out either at your own workplace or for a new employer. Your work tasks can be familiar to you or new. Typically, a work try-out lasts for 2-3 months, but for justified reasons, it can be extended to 6 months. Your weekly working hours during a work try-out can vary from about 20 hours to a full working week. The work try-out period can be paid or unpaid. Paid work try-out: Your employer pays you a full salary regardless of how many hours you work. In that case, the rehabilitation allowance is paid to your employer. If your salary is smaller than the rehabilitation allowance, the difference will be paid to you. You and your employer commit to regular employment obligations and right. Unpaid work try-out: You get a fixed rehabilitation allowance during the work try-out period. In that case, your employer does not pay you a salary or have other expenses for that period. Your pension provider will take out accident insurance for you while you are doing your work try-out. Work counselling supports you when you start working with new tasks either at your current or a new workplace. The work counselling period can be longer than the work try-out period. When needed, it can also include external training or courses. The work counselling period can be paid or unpaid. a degree from a university of applied sciences. The training can also be in the form of courses or continuing training. You have to apply for the training through regular application channels. Your pension provider can grant you a business subsidy to start a new business or to continue your self-employment. You can use the business subsidy to buy, for example, assisting devices and power tools or make necessary alteration work to make it easier for your to do your work. To get the business subsidy, you have to have an appropriate plan. In addition, your pension provider will examine that your business is viable. Nordic agreements and cooperation secure your right to vocational rehabilitation when you work in any of the other Nordic countries than the one you live in. The different Nordic countries have different legislation concerning vocational rehabilitation. As a person applying for rehabilitation, you may have problems meeting the criteria for rehabilitation benefits and measures if you work in one Nordic country and live in another. To make sure that you do not lose your right to rehabilitation and related benefits, the Nordic countries have signed bilateral rehabilitation agreements. The Nordic rehabilitation agreements are based on EU Regulations 883/2004 and 987/2009 and the sections of the Nordic social security agreement concerning cross-border rehabilitation.